The Gynaecological Department is one of the 3 oldest departments and one of the busiest of Arpana hospital. 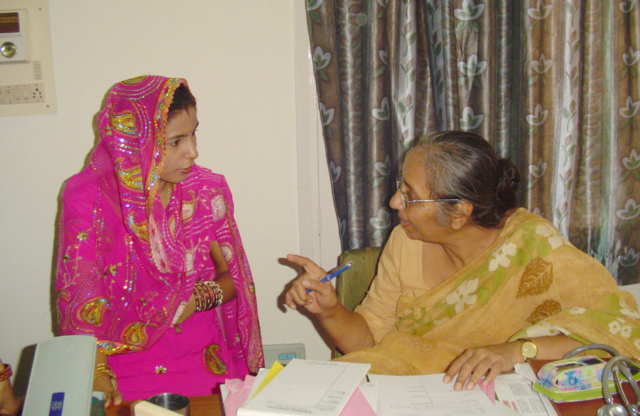 The department was set up and nurtured by Dr. (Mrs) Ela Anand FRCOG, FIMSA, to provide much needed obstetrical and gynaecological services to our disadvantaged rural sisters. Dr Ela Anand retired from active duty in the hospital in December 2008. Now, Dr. Kavita Rani MBBS, M.S. (Gynae) is very ably managing the Department along with Dr. Nisha Gandhi. They manage pregnancies & problems like infertility recurrent abortions menstrual disorders, fibroids , prolapsed uterus endometriosis etc. In addition to deliveries, normal and complicated, the Department takes care of major gynaecological surgeries - hysterectomies, both abdominal and vaginal and all minor gynaecological problems.